The Gowanus Lounge: Revenge of Old Dutch Mustard? 80 Met Advertises "Condoburg"
Revenge of Old Dutch Mustard? 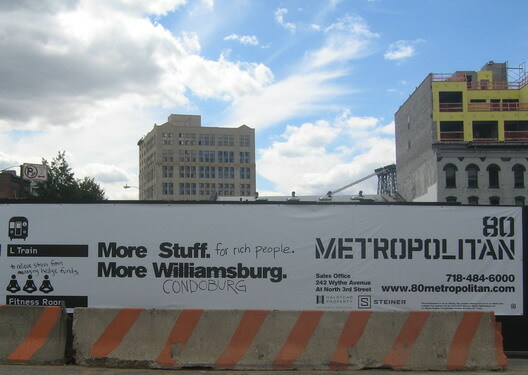 80 Met Advertises "Condoburg"
We were more than a little amused--and so were countless passersby of all ages and backgrounds--to find the sales banner for 80 Metropolitan in Williamsburg had undergone some changes. It is one of the only times we have seen people stopping and staring, and laughing, at a condo sign anywhere in Brooklyn. Those of you with a memory for Brooklyn buildings will recall that 80 Metropolitan is rising on the site of the demolished Old Dutch Mustard Building.